Welcome to Sire (also spelt Sira), a hitherto underrated spur of land where the sea laps the greens of a golf course and village life continues in much the same way as it has done for centuries. 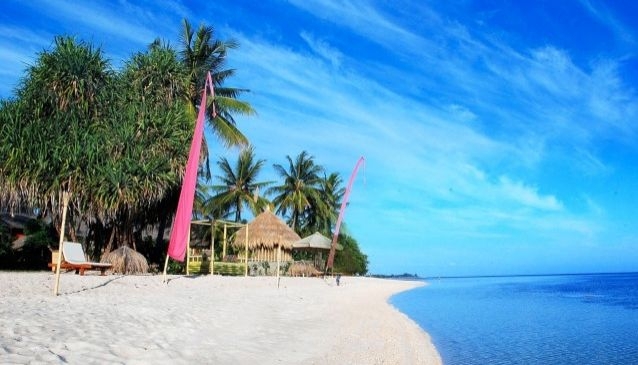 The assets of Lombok’s longest white sand beach, however, did not go unnoticed, and recent years have heralded the arrival of some splendid residences and a boutique hotel. Now Sire is on everybody’s lips, and real estate is at a premium, making this the most exclusive neighbourhood in Lombok. Sire Beach is home to four, spectacular private villas – Sepoi Sepoi, Sira Beach House, The Anandita, and Villa Sapi complete with its own cooking school – each one a beautiful beachfront holiday rental property and wedding venue, offering luxurious accommodation with between four and six bedrooms each, full teams of staff, five-star services and fabulous facilities. Yet the area is still secluded, there are no untidy warungs, bars or annoying beach hawkers, and the beach remains unspoilt and tranquil, with its crystal calm waters and mellow currents allowing safe swimming for all the family. Also positioned absolutely beachfront is Hotel Tugu Lombok. Romantic and atmospheric, this funky-fantastic, antique-chic hotel, with a restaurant, bar, and spa open to outside guests, is a living museum of Indonesian antiques and fascinating artworks. Another draw to the area is the Lombok Golf Kosaido Country Club, an 18-hole championship course, which follows the natural contours of the land and has been challenging golfers of all levels since 1993. Just across the bay, at the market village of Tanjung is The Oberoi Lombok Hotel, a cluster of exquisite pool villas, terrace pavilions and a spa, set within coconut palm gardens complete with a jetty – should you arrive by boat – and a gourmet beachside restaurant. Tanjung Market, meanwhile, sells everything that is grown or produced on the island. Coffee beans, fruits, vegetables, meat, smoked fish on sticks, blocks of locally harvested tobacco, peanuts, cashews, and the red, hot chilli peppers from which Lombok takes its name, are all available somewhere amid the narrow alleys and rich aromas of the heaped stalls. Despite the out-of-town location, there’s plenty to do at Sire Beach as each of the four villas and two boutique hotels offers every amenity to make for an unforgettable luxury family holiday or honeymoon, with – in addition to golf – activities such as cycling, kayaking, snorkelling, boat trips, yoga and cooking classes. The Gili Islands are perfect for a day out, filled with a flabbergasting choice of restaurants and bars, and blessed with yet more white-sand beaches and amazing coral reefs; the many dive companies there offer courses and single dives to see turtles, sharks and manta rays, and you can also go deep sea fishing. The Gilis can be reached within 30 – 40 minutes with a chartered local boat pick-up from the beach, or within 15 – 20 minutes by chartered speedboat. Daytrips can also be made to the pretty mountain village of Senaru, gateway to the Gunung Rinjani National Park, offering a gentle walk along the river valley to two breathtaking waterfalls: the 40-metre, tiered waterfall and natural spring known as Sindang Gila, and the awesome Tiu Kelep. Yet, at the end of a day out, when you return to your magnificent accommodation at Sire Beach – which incidentally ranks as one of the loveliest beaches in the world – you’ll probably find that you’ll never want to leave. Enjoy!